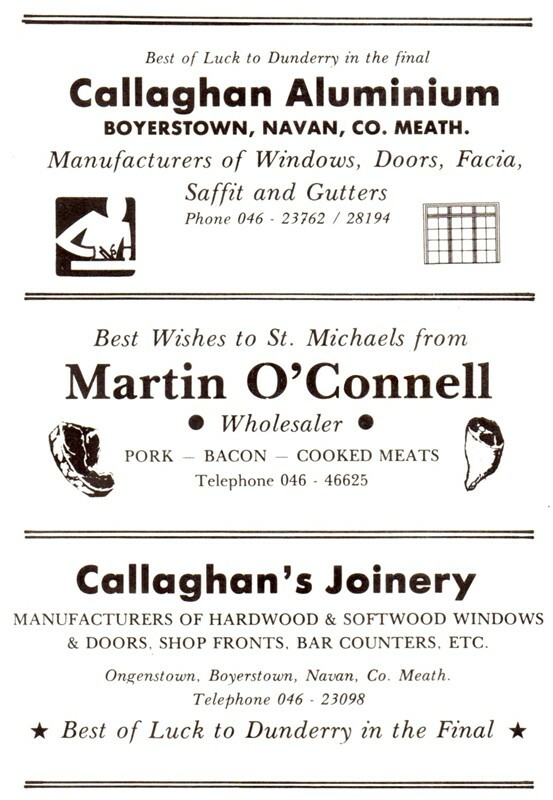 from the Meath Chronicle dated September 25th 1982. St. Michaels will enter next Sunday’s J.F.C. Final at Navan’s Pairc Tailteann with the tag of hot favourites and must be fancied to make amends for their defeat by Moynalvey at the same stage a year ago. But while they appear to have the talent and the class to take the honours they will remember that their opponents, Seneschalstown also entered the semi-final as clear outsiders but pulled off one of the shocks of the season by defeating Moynalty who were many peoples fancies to win the competition. Seneschalstown field a brand of youthful and experienced players and whether they can cause another major surprise is questionable. 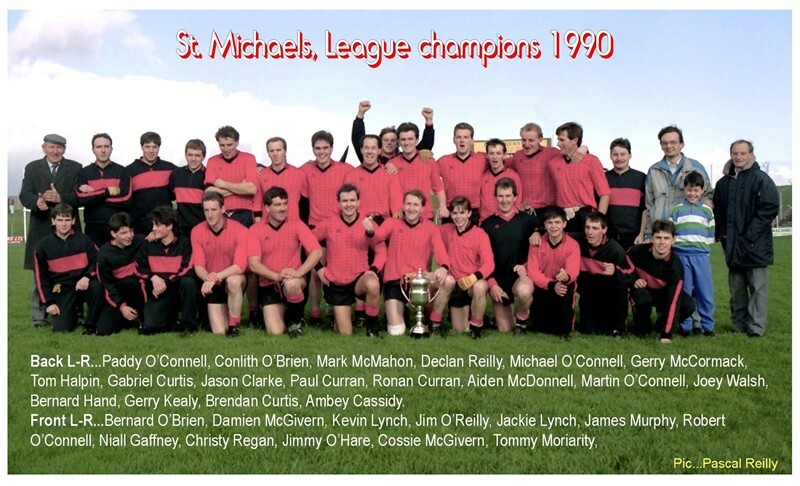 St. Michaels, a combination of the now defunct Carlanstown and Kilbeg clubs, will depend to a large extent on the O’Connell brothers, Robbie, Michael, Martin and Pat – to steer them to victory and if these four hit form their prospects will be greatly enhanced. Robbie, Michael and the highly promising Martin were in tremendous form in the semi-final victory over Wolfe Tones and all three are capable of troubling the strongest of defences. 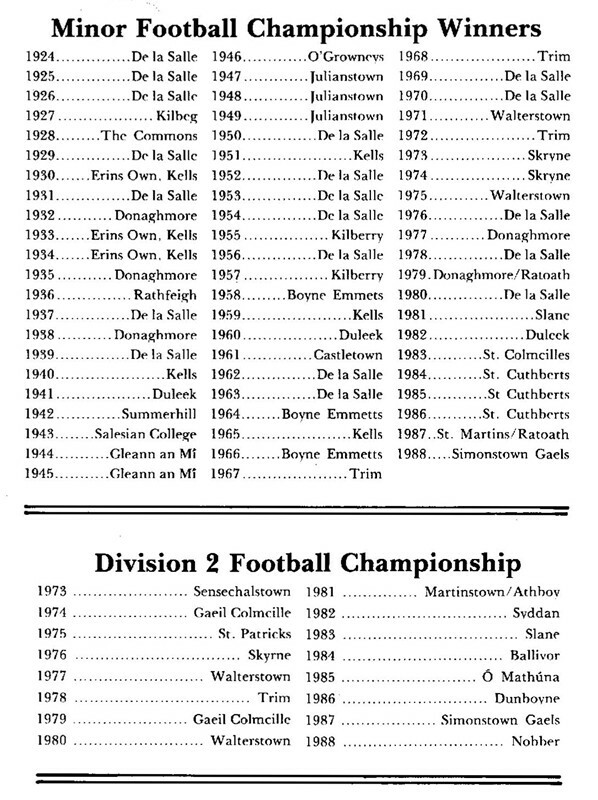 So it is obvious that if Seneschalstown are to take their first adult title since they won the senior championship in 1972, they will need to perform well up to scratch in defence. 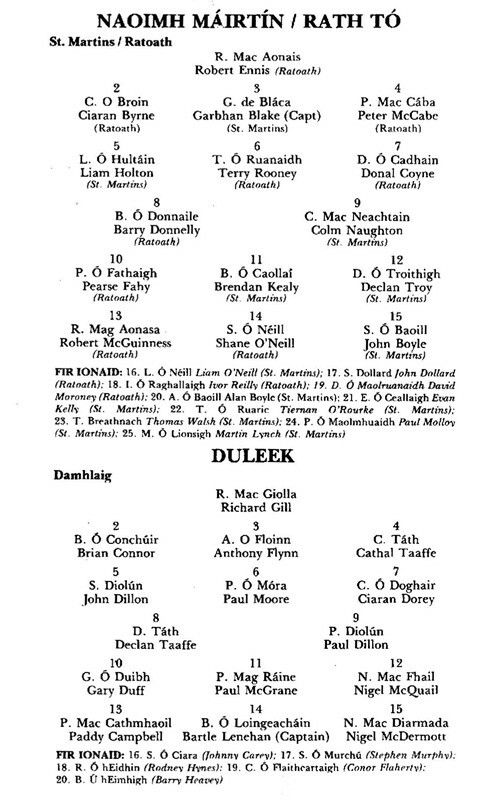 With former Meath star Mickey Collins at full back and another experienced performer, Mickey Dillon directly in front of him, the Furze side appear strong at the back but some of their players may lack the pace needed to hold a speedy St. Michaels forward line. 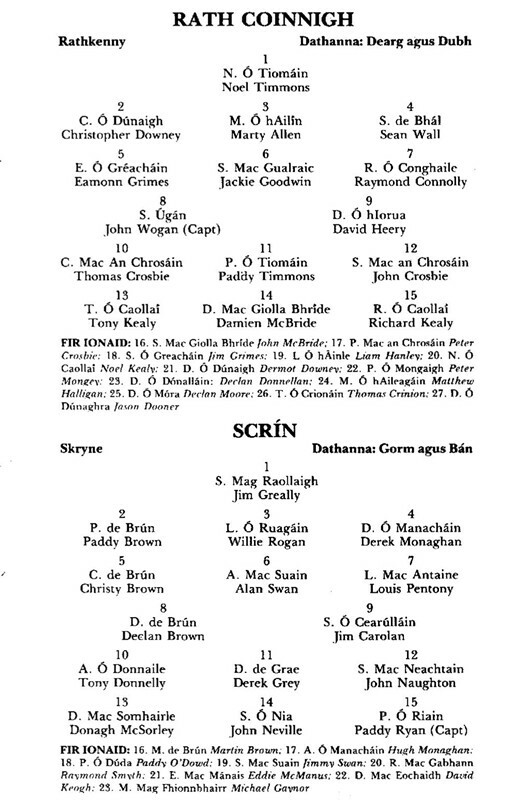 There should be an interesting battle at midfield between Robbie O’Connell and John McCormack and the probable Seneschalstown pairing of Billy Collins and Terry McDonagh, both of whom are also highly experienced. Collins and McDonagh played a significant role in their sides victory over Moynalty are are sure to make the St. Michaels pair battle for every ball. Seneschalstown also will rely on experience in attack where Joe O’Brien, Frank Sheridan and former “great” Ollie Geraghty will be expected to contribute much. While their vast experience should be of great value in the final it may also prove to be their downfall as some of their players are likely to find the going a bit on the tough side as the match progresses. Almost half their team on Sunday will be 30 or over and with this in mind it seems likely that St. Michaels will be finishing strongly. So in the event of a close finish they should have the edge. It was only after a replay that “Michaels” lost to Moynalvey in last years final and one considers how well Moynalvey fared in their first season in the intermediate grade it is obvious that the Carlanstown – Kilbeg combination are a very formidable side. As well as the O’Connell brothers they also have sound performers in goalkeeper Sean Briody, backs Jackie Lynch and James Murphy and Jimmy Farrelly in attack. 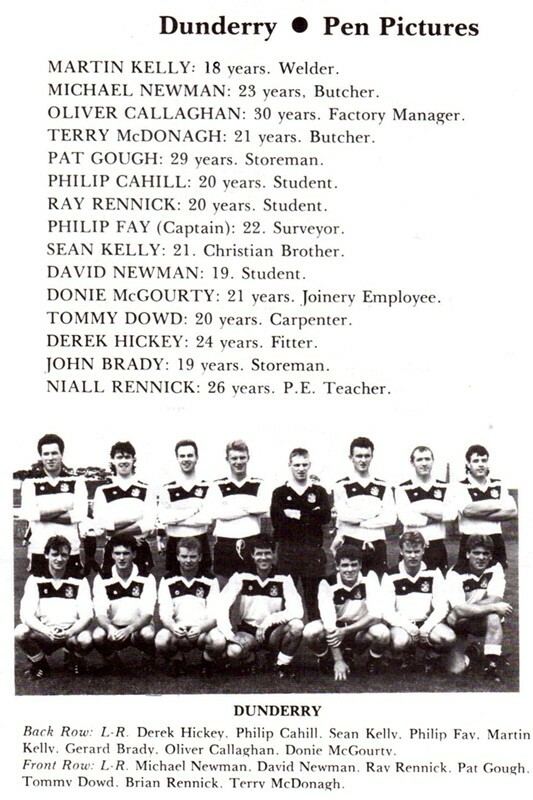 They are coached by Nobber defender Shane McEntee and are trained by local man, Paddy McIntyre. Age: 24, Occupation: plasterer, Medals: 1 div. 3 FC. Age: 24, Occupation: carpenter, Medals: 1 div. 3 FC. Age: 24, Occupation: construction worker. Age: 24, Occupation: farmer, Medals: 1 div. 3 FC. Age: 25, Occupation: panel operator, Medals: 1 div. 3 FC. Age: 32, Occupation: brick-layer, Medals: 1 div. 3 FC. Age: 24, Occupation: construction worker, Medals: 1 div. 3 FC, 1 factory FL. Age: 23, Occupation: bank official, Medals: 1 div. 3 FC. Age: 25, Occupation: coal merchant, Medals: 1 div. 3 FC. Age: 24, Occupation: farm manager. Age: 19, Occupation: butcher, Medals: 1 div. 3 FC. 1 U-14 HC, 1 U-16 HC. ( both with Longwood ). Age: 24, Occupation: Gypsum Ind employee, Medals: 1 factory FL. Age: 29, Occupation: haulage contractor, Medals: 2 div. 3 FC. Age: 25, Occupation: welder, Medals: 1 div. 3 FC. 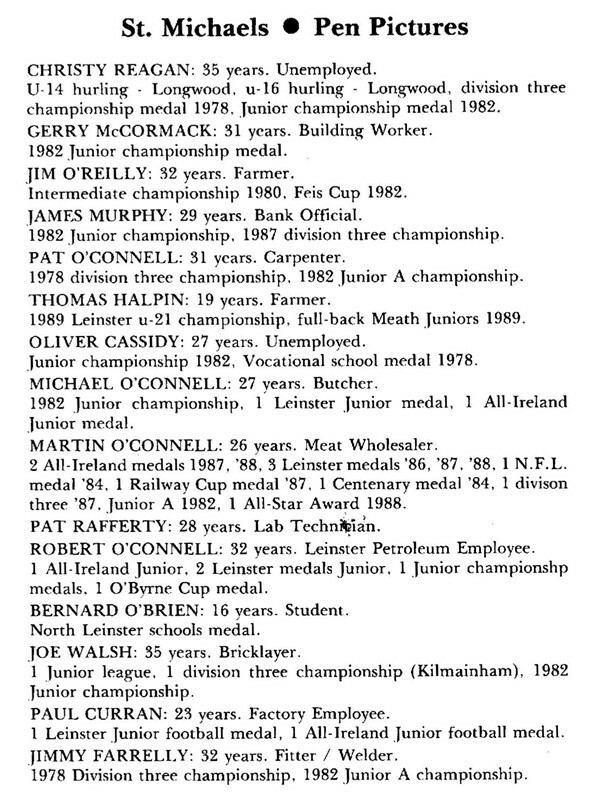 Age: 26, Occupation: farmer, Medals: 1 div. 3 FC. Age: 29, Occupation: construction worker. 1 Meath VS FC, 1 Leinster VS.
Age: 23, Occupation: lorry driver. Age: 21, Occupation: process operator. Report by Tom Mooney from the Meath Chronicle dated October 2nd 1982. St. Michaels, last years beaten finalists justified their ante-post favouritism by defeating Seneschalstown in the JFC decider at Navan’s Pairc Tailteann last Sunday writes Tom Mooney. They were odds-on going into Sundays game against a Seneschalstown side which had astonished many by reaching the final and which was very unlucky not to astonish even more. The Yellow Furze side did not deserve to lose , they looked fitter, sharper and more determined for most of the game and the craftiness of their veterans frequently enabled them to outwit their opponents who seemed over confident in some ways, extremely nervous in others and generally lacked the dash which has become their trademark. St. Michaels seemed like a very ordinary side for 55 of the 60 minutes and it was only in the closing stages when threatened by the jaws of defeat that they managed to raise their game sufficiently to stamp their authority on the match. Five minutes from time they were trailing 1-4 to 1-7 and looked doomed for defeat but then Robbie O’Connell clicked into top gear, inspired his colleagues to move into overdrive and they added 1-2 without reply to scuttle a rapidly tiring Seneschalstown outfit. While St. Michaels must be congratulated for winning the first championship in the club’s short history and atoning for last years bitter disappointment one must sympathise with Seneschalstown. Unfancied almost throughout the campaign they proved the punters wrong and with a little bit of luck would have shocked the Carlanstown Kilbeg combination. Foremost in the sympathy stakes must be the oldest member of the team, Ollie Geraghty, and one of the youngest Michael Monaghan who contributed enormously to Seneschalstown’s performance. Geraghty seemed to prove Mae West’s dictum, “life begins at forty” as the 40 years plus veteran did untold damage in the Micks defence and scored a glorious goal. The first half was scrappy but the second was thrilling and exploded in a climax of excitement as St. Michaels fought back from the “dead” to gain victory. Seneschalstown dominated the first half, though they had the backing of a stiff breeze and the elements they could not be blamed for St. Michaels playing second fiddle. 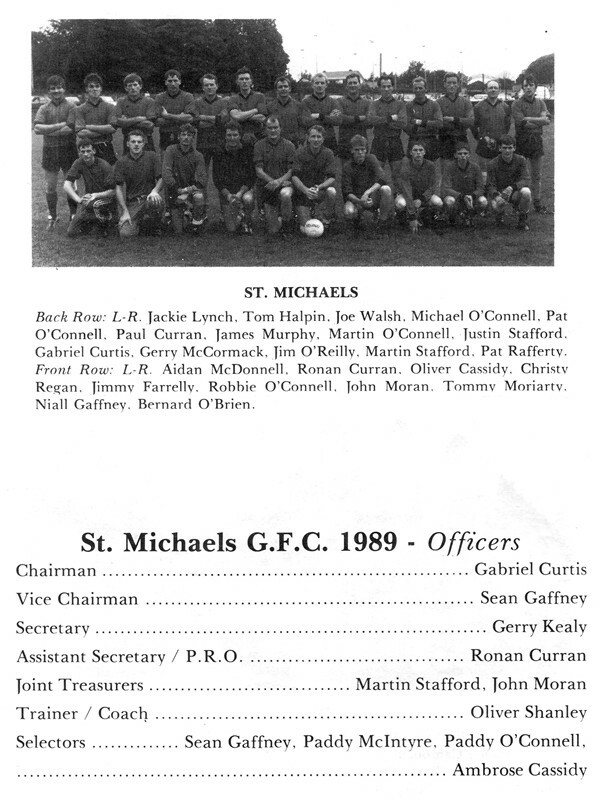 Most of their members ranged from poor to pathetic and only for the efforts of their outstanding right corner back Gerry McCormack and to a less extent James Murphy on the same flank, St. Michaels could have been overrun. 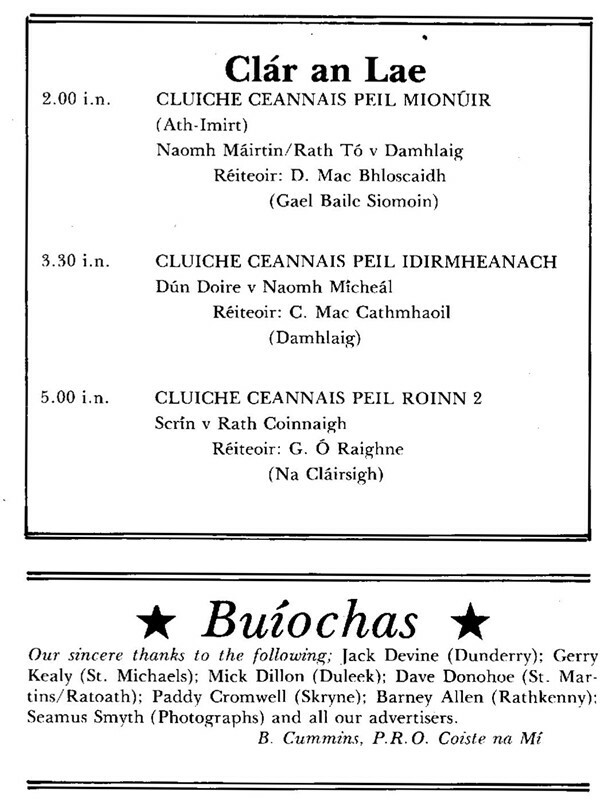 Ably supported by Terry McDonagh, Billy Collins dominated at midfield and Phonsie Gilsenan, Mickey Collins and Jim Farrell dealt capably with whatever passed those two. Having so much possession most of the Seneschalstown forwards had plenty of opportunities to look good and this they did – at least in the approach work. 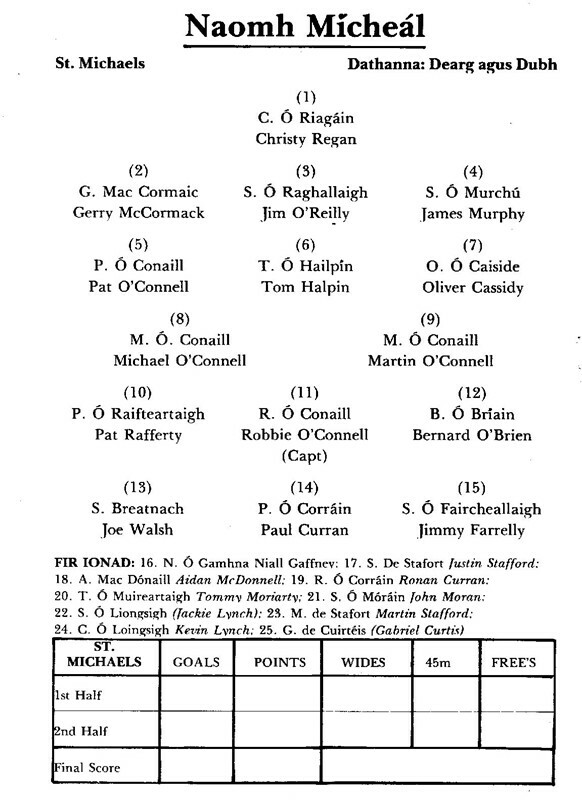 Gerry Clarke, Frank Sheridan, Monaghan and Patrick Darby and of course Geraghty, frequently had the St. Michaels defence under intense pressure, but for all that, managed to lead by only 0-4 to 0-2 at the interval. Joe O’Brien, Sheridan, Collins with a lovely effort from 45 meters and Darby accounted for their first half points, but they should have added a goal. A Darby shot beat Sean Briody in the winners goals, but Murphy cleared off the line. Both of St. Michaels first half scores came from pointed frees from Robbie O’Connell following fouls on his brother Michael. Someone obviously told their players some “home truths” at the interval as within 12 seconds of the resumption they snatched the lead. Jimmy Farrelly who had been switched from midfield during the first half, was restored to that position at the start of the second half. He caught the throw-in and his delivery came to Paddy Rogers who lashed a great effort under the diving body of Raymie McGovern. But Monaghan equalized after Geraghty had been fouled and then encountered a Christopher Regan point to leave the sides level again 0-6 to 1-3 after 39 minutes. Monaghan obliged again after another foul on Geraghty and although the O’Connell brothers obliged again to draw the sides level once more in the 50th minute – Michael was fouled and Robbie slotted over – there were huge danger signs warning St. Michaels. A lovely flick from Sheridan put Geraghty behind the defence, he first timed past the advancing Briody and as the ball was rolling wide of the empty net the in – rushing Darby just failed to tap it inside the post. Later Murphy did very well to cut out an extremely dangerous centre when a goal looked “on” and so well were Seneschalstown playing that another shock looked on the cards when Geraghty netted. He fielded a Darby centre beautifully, turned and lashed to the net to put Seneschalstown 1-7 to 1-4 ahead in the 51st minute, a lead they held until the 55th. 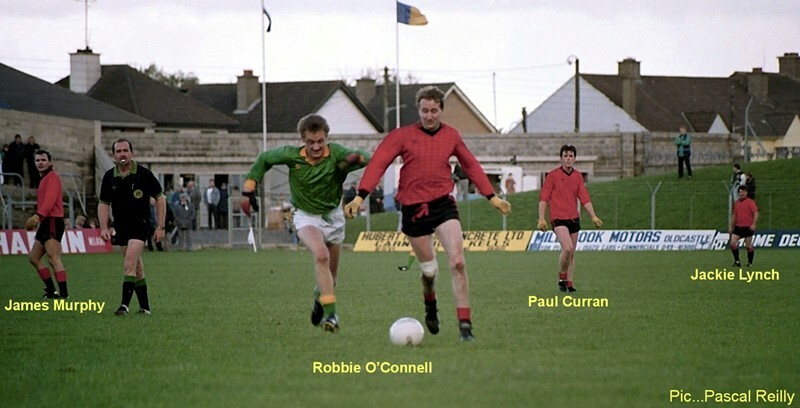 But then Robbie O’Connell earned his pay as captain and although he started in the surprise position of right half forward, he was switched to midfield in the second half. He commanded his sector in the last stages and was ably assisted by Farrelly who found a new lease of life. A great goal by Joe Walsh who had been moved forward from midfield, sparked off that dramatic and exciting finish. He latched on to a loose ball and from 25 meters crashed a rasping shot off the underside of the bar into the net. Robbie O’Connell wasted two good chances of points by trying to lob the ball into the square before he eventually slotted over, he then started a move, carried on by Walsh which ended with Michael O’Connell notching an insurance much to the rapture of the St. Michaels fans. After the game, Brian Smyth, chairman of the Co. Board presented the Matthew Ginnity Cup to Robbie O’Connell captain of the victorious St. Michaels team. 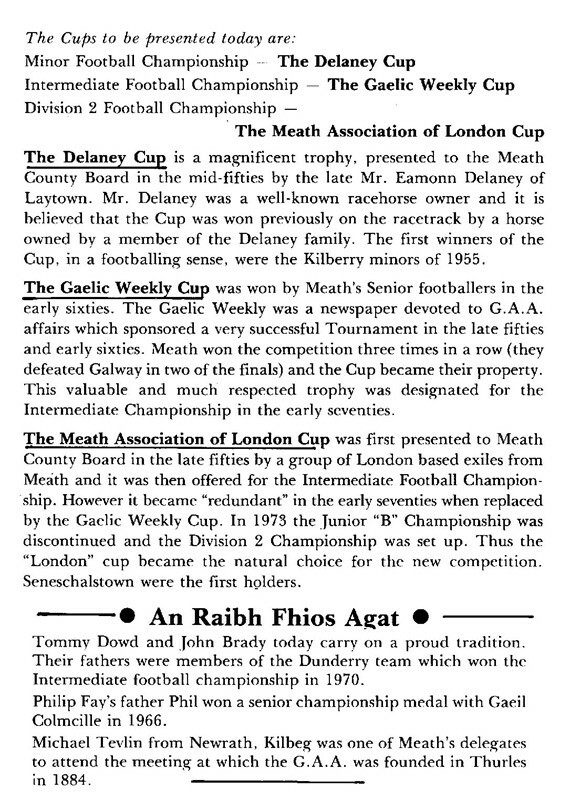 The cup was donated to the Co. Board by the late Mick Hilliard to perpetuate the memory of a man, the uncle of minor board secretary Fintan Ginnity, who had been interned in the Curragh along with the former T.D. And Minister. Robbie O’Connell 0-4, Joe Walsh, Paddy Rogers 1-0 each, Christy Regan, Michael O’Connell 0-1 each. 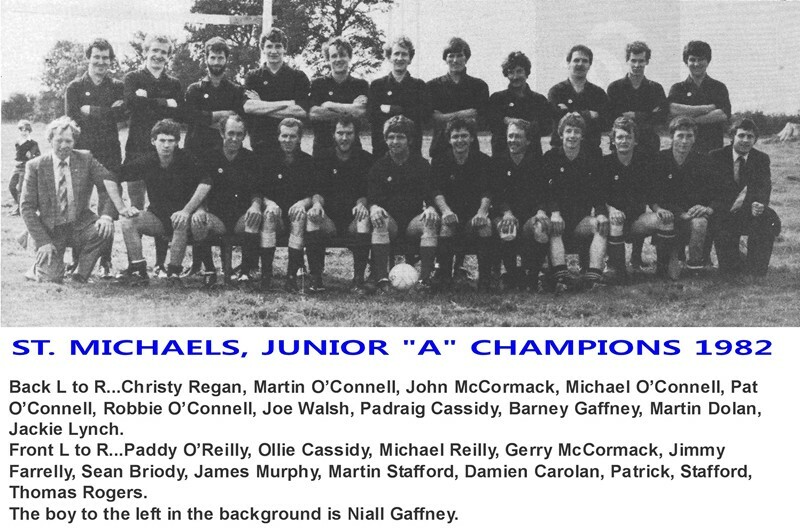 Sean Briody, Gerry McCormack, Pat O’Connell, Padraig Cassidy, James Murphy, Jackie Lynch, John McCormack, Joe Walsh, Jimmy Farrelly, Robbie O’Connell, Martin O’Connell, Paddy Rogers, Jimmy Rafferty, Michael O’Connell, Christy Regan. Subs – Justin Stafford for Lynch, Barney Gaffney for Rafferty. Coach: Shane McEntee, trainer: Paddy McIntyre. O. Geraghty 1-0, M. Monaghan 0-3, B. Collins, F. Sheridan, P. Darby, J. O’Brien 0-1 each. 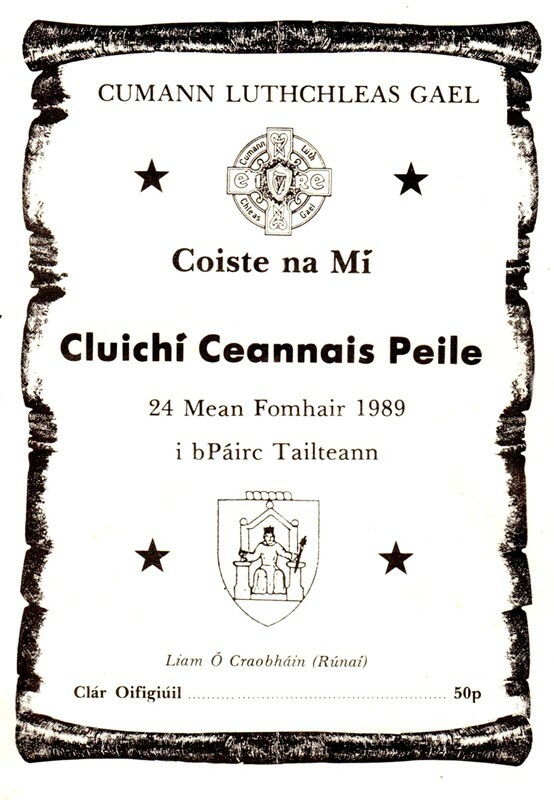 R. McGovern, P. Gilsenan, M. Collins, S. Cummins, D. Sheehy, M. Dillon, J. Farrell, T. McDonagh, B. Collins, G. Clarke, F. Sheridan, M. Monaghan, P. Darby, O. Geraghty, J. O’Brien. Sub: M. Connell for O’Brien. Referee: Bernard McCluskey Simonstown Gaels. 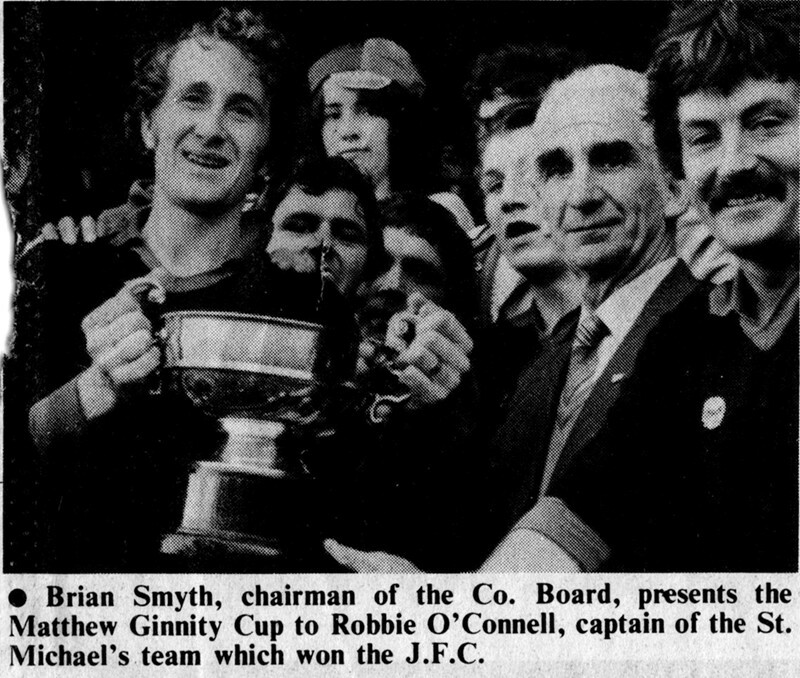 Report from the Anglo Celt newspaper October 2nd 1982. It was third time lucky for St. Michaels in last Sundays thrilling Meath Junior Football Championship Final at Pairc Tailteann, Navan, as the Carlanstown-Kilbeg combination finished strongly to pip a gallant Seneschalstown side by two points. Michael’s had been runners up in 1981 and beaten semi-finalists the previous season and they looked set for another disappointment when trailing by three points with just four minutes to go. But then Joe Walsh, who had been switched from midfield to attack, collected a loose ball and crashed a terrific shot to the Seneschalstown net to open up the game again. 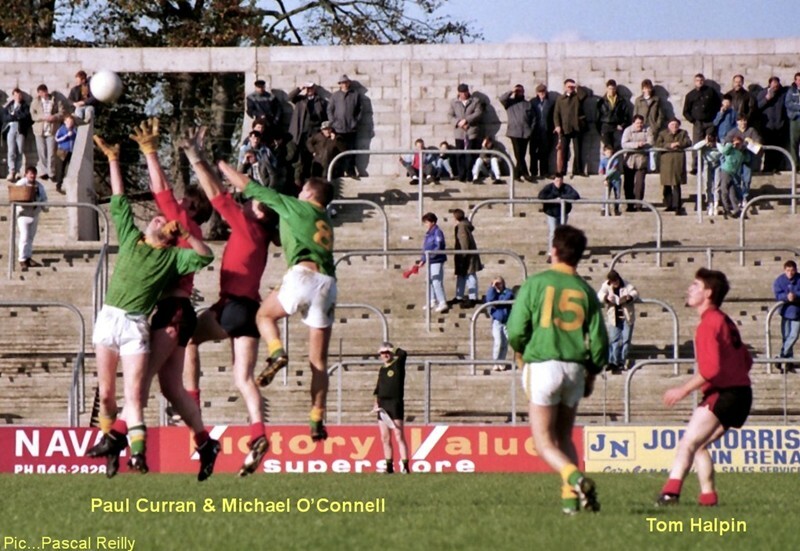 Then after a Jimmy Farrelly shot was deflected out, Robbie O’Connell sent the resultant ’45’ high between the uprights to regain the lead for St. Michaels. The winners did all the pressing in the closing stages and Michael O’Connell added another point before the final whistle. The north Meath side did not look like winners in the first half as they faced the wind and played second fiddle to a Seneschalstown side who controlled midfield and put some nice attacking moves together. With Terry McDonagh and Billy Collins showing up well at midfield and Frank Sheridan, Patrick Darby and 42 year old Ollie Geraghty impressing up front, Seneschalstown were really putting it up to their fancied opponents. Sheridan increased their lead before Robbie O’Connell opened the winners account with a pointed free in the 18th minute. Earlier Michaels were fortunate not to fall further in arrears when James Murphy took a Darby shot off the goal line. However the losers were not sharp enough in attack and some missed chances proved the difference between victory and defeat. They led by 0-4 to 0-2 at the interval after points from Darby and Robbie O’Connell with another pointed free. Michael’s got a tremendous start to the second half and right from the throw-in Robbie O’Connell, who was switched to midfield, gained possession and sent through to Paddy Rogers who flashed a great shot to the net to leave his side ahead for the first time. It looked as if the hot favourites, St. Michaels might take a firm grip after that score but Seneschalstown refused to panic and after O’Brien missed another close in free Michael Monaghan equalised from a placed ball awarded for a foul on Geraghty. Christy Regan edged Michael’s back in front after taking a pass from Rogers but Michael Monaghan levelled from a free after Darby was fouled. Geraghty was unlucky to see a ground shot from him go just inches wide after Sheridan chipped a lovely ball through to him. Seneschalstown were doing most of the pressing at that stage and after Geraghty was halted illegally, Monaghan made no mistake with the resultant free. Michael’s replied with Robbie O’Connell tapping over a free after Michael was fouled. Then they were stunned in the 52nd minute when Geraghty crashed a great shot to the net following a cross from Darby. It looked as if Seneschalstown were about to upset the odds but the winners finished the stronger to notch 1-2 in those tense closing minutes and make up for all those past disappointments. 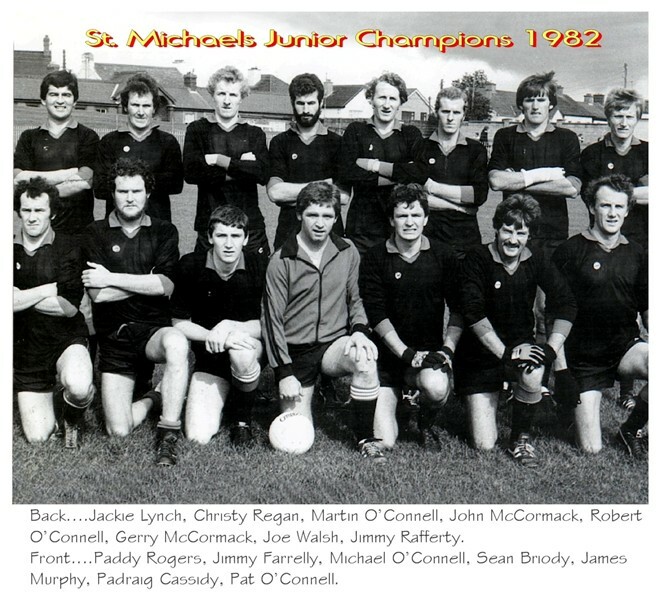 Gerry McCormack, Padraig Cassidy, James Murphy, Robbie and Martin O’Connell, Jimmy Farrelly and Paddy Rogers were the best for St. Michaels with Mickey Collins, Seamus Commons and Jim Farrell also prominent for the losers. After the game Co. Board Chairman Bryan Smyth presented the Matthew Ginnity Cup to St. Michaels captain Robbie O’Connell. Sean Briody, Gerry McCormack, Pat O’Connell, Padraig Cassidy, James Murphy, Jackie Lynch, John McCormack, Joe Walsh, Jimmy Farrelly, Robbie O’Connell, Martin O’Connell, Paddy Rogers, Jimmy Rafferty, Michael O’Connell, Christy Regan. Subs – Justin Stafford for Lynch, Barney Gaffney for Rafferty. R. McGovern, P. Gilsenan, M. Collins, S. Cummins, D. Sheehy, M. Dillon, J. Farrell, T. McDonagh, B. Collins, G. Clarke, F. Sheridan, M. Monaghan, P. Darby, O. Geraghty, J. O’Brien. Sub: M. Connell for O’Brien. 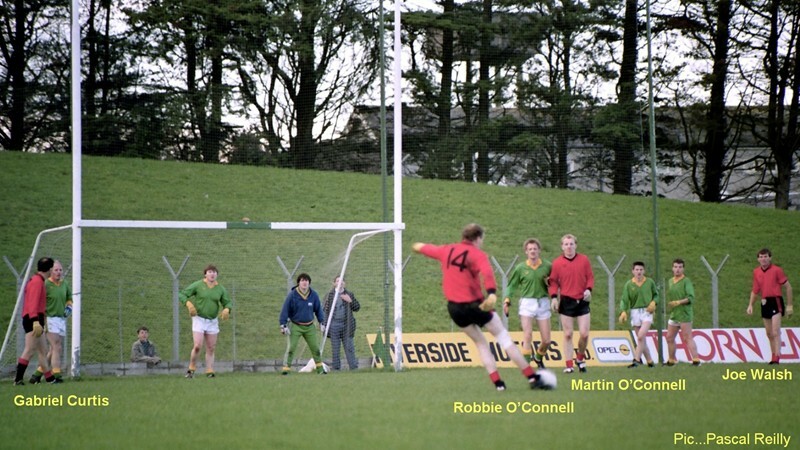 FARRELLY GOAL RALLIES SAINTS ( 1989 IFC Quarter-final ). St. Michaels 1-8, Kilmainhamwood 0-9. North Meath rivals St. Michaels and Kilmainhamwood served up a thrilling IFC quarter-final which hung in the balance until the end at rain soaked Kells on Saturday night ( 19th. August ). The Carlanstown – Kilbeg combination progressed to the penultimate stage despite playing second fiddle until the 54th minute when corner-forward Jimmy Farrelly struck an opportunist goal which drew the sides level at 1-6 to 0-9. 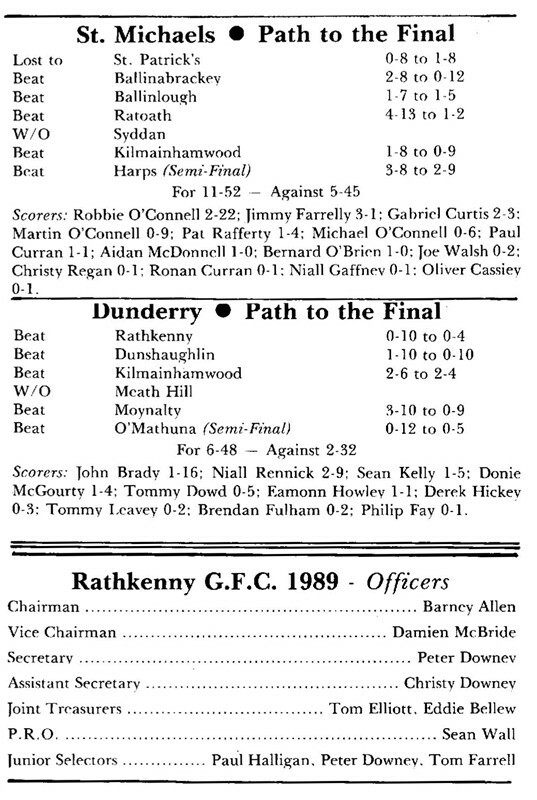 It could have been so different if Kilmainhamwood had taken their numerous scoring opportunities. The slippery conditions always made control difficult and inability to cope cost the winners strike force dear. Although they struggled they were on level terms 0-3 each at the end of the first quarter with points from leading scorer Robbie O’Connell ( two ) and an out of tune Gabriel Curtis, who was replaced after the break. The “Wood” had looked sharper during that period and a sixth minute Aidan Crosbie free gave them the lead before Brian Stafford opened his account from play. Willie Mooney their third after he was allowed plenty of room by a slack defence. 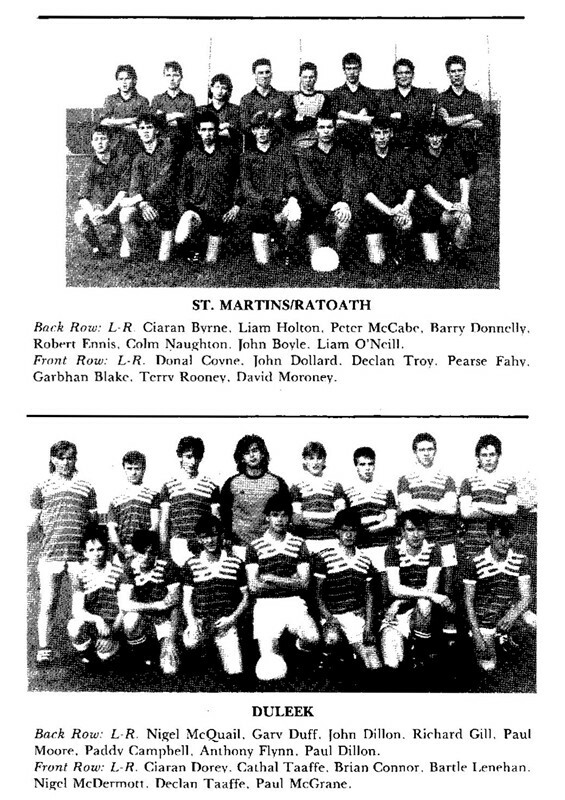 The winners fell behind soon after Ollie Cassidy lost possession to Dominic Keogan who pointed and then a four man move involving Seamus Reilly, Mooney, Stafford and the roving Larry McCormack stretched the lead when the latter’s dipping shot was brilliantly tipped over by the “Saints” ‘keeper Christy Regan. Stafford and Pat Rafferty exchanged further points before the interval at which stage the “Wood” were ahead 0-6 to 0-4. The pattern appeared likely to continue after the resumption, but some five saves by Regan, coupled with poor finishing, left St. Michaels within striking distance 0-5 to 0-8, as the game entered the final quarter. Michael O’Connell was moved to full forward and paid immediate dividends with a good point, while at the other end Stafford hit the post before supplying the pass from which Crosbie struck his second point of the night. St. Michaels were surging forward at this stage inspired by some great fielding from centre back Thomas Halpin, but they were unable to make a breakthrough due mainly by the efforts of Jim Rooney, Martin Crosbie and Gerry Bennett. However with six minutes remaining Paul Curran sent in a high ball which Justin Stafford fielded. He turned and shot under pressure but the ball broke as Farrelly reacted quickest and he finished to the net off the woodwork. With panic setting into the losers defence subsequently they conceded simple frees and Robbie O’Connell converted two of them before the final whistle. They also struck an amazing tally of four wides in as many minutes and will need to remedy this malaise before their next outing. St. Michaels: Christy Regan, Gerry McCormack, Jim O’Reilly, James Murphy, Pat O’Connell, Tom Halpin, Ollie Cassidy, Michael O’Connell 0-1, Martin O’Connell, Joe Walsh, Paul Curran, Pat Rafferty 0-1, Jimmy Farrelly 1-0, Gabriel Curtis 0-1, Robbie O’Connell 0-5. Subs: Aidan McDonnell for Walsh, Justin Stafford for Curtis, Ronan Curran for Farrelly. Kilmainhamwood: R. Finnegan, M. Shankey, J. Rooney, M. Connor, G. Owens, M. Crosbie, G. Bennett, N. Shankey, H. Malone, A. Crosbie 0-2, S. Reilly, W. Mooney 0-1, D. Keogan 0-1, B. Stafford 0-4, L. McCormack 0-1. Sub: P. McGee for Mooney. Referee: Vincent Lynch Gaeil Colmcille. Report from the Meath Chronicle 26th August 1989. 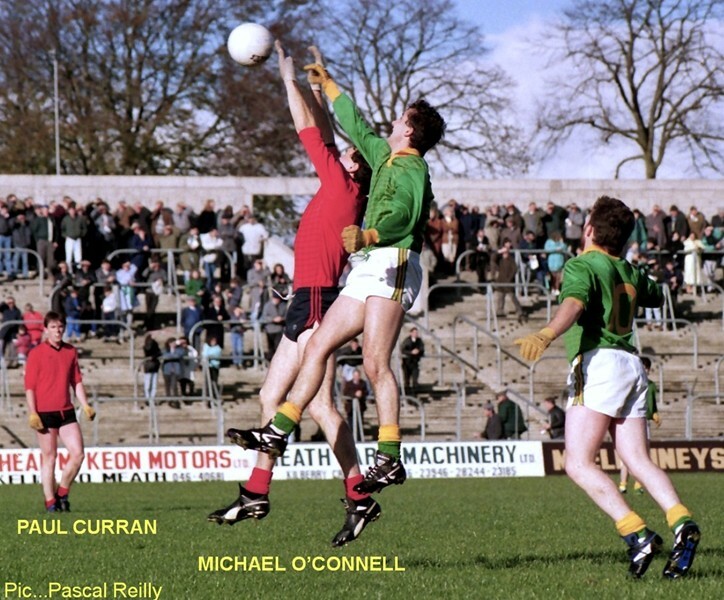 MICHAELS TOPS IN SUPER MATCH ( 1989 IFC semi-final ). St. Michaels 3-8, Harps 2-9. St. Michaels could have been forgiven for thinking that all they had to do was turn up at Kilberry on Sunday night for their IFC semi-final clash with the Harps. 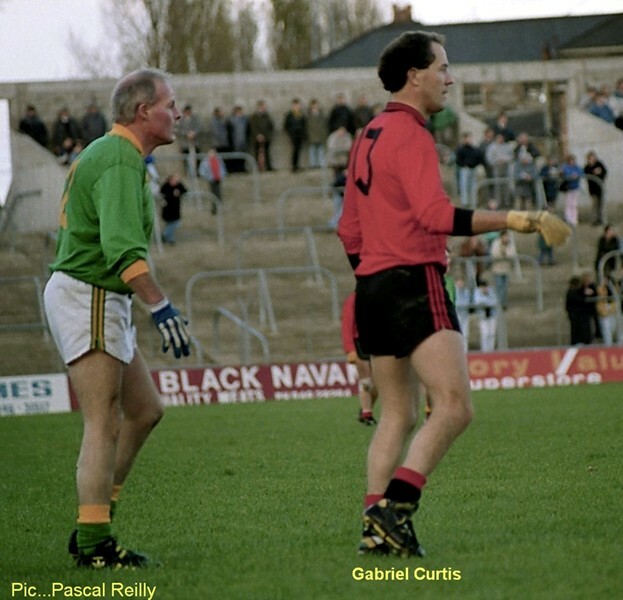 When the sides met 12 months earlier in Kells the Martry side were beaten out of sight. A predictable start suggested that little had changed. A two goal burst in the opening 10 minutes left the Carlanstown – Kilbeg combination in the driving seat. Then the losers began to compete. Peter Marley at midfield led by example, Joe Kenny, Mattie Yore and Christy Murray presented a formidable obstacle to Martin O’Connell’s men. Ken and Dermie Rennicks used their vast experience to telling effect as Harps played their way back into contention. 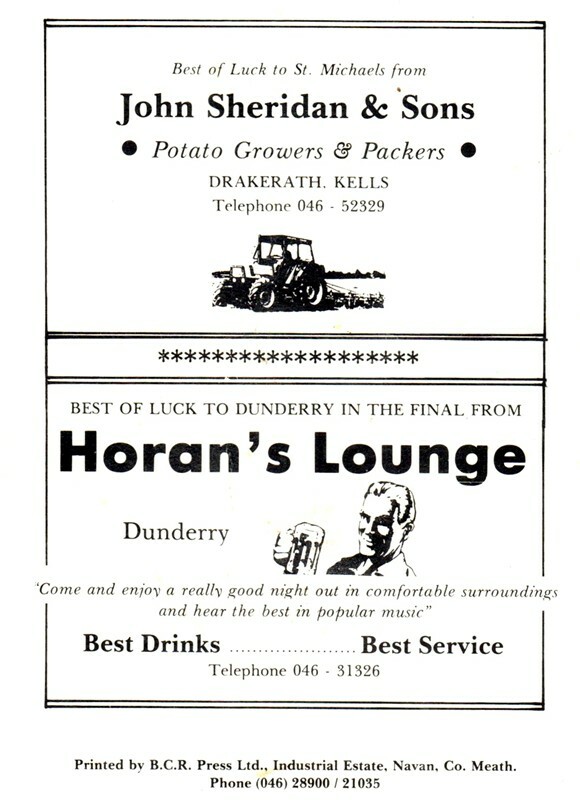 But for a couple of subsequent disasters they would be meeting neighbours Dunderry in this year’s decider. This was without doubt a memorable semi-final and one of the best games in any grade this year. Robbie O’Connell set the trend with a second minute point and a minute later Jimmy Farrelly netted from Paul Curran’s centre. Harps replied with points from Marley (free) and Ken Rennicks, before Curran flicked the Saints second goal for a 2-1 to 0-2 lead. GREAT POINTS: With a rout seeming likely the underdogs stemmed the flow and two great points from Seamus Rispin kept them in touch. Displaying a new found belief they laid siege to their opponents’ goal. A Ken Rennicks flick came back off the crossbar before Mick Moriarty struck for first of his two points. In the 20th minute they took the lead. Kenny began the move deep in his own half which finished with Dessie Rogers flashing Moriarty’s cross to the net for a 1-5 to 2-1 advantage. The celebrations quickly turned sour. From the kick out Michael O’Connell won possession in midfield, as he bore down on goal he sent a speculative ball towards his front men which Harps ‘keeper Paddy Kavanagh raced out to catch. He completely misjudged its flight and it ended up in the back of the net. The sides exchanged a couple more points before the interval at which stage Harps trailed by 1-7 to 3-3. TOOK TOLL: While they began the second half impressively with a Marley point the exertions of the opening half took their toll. St. Michael’s dominated the third quarter and increased their lead. Robbie O’Connell (three), Ollie Cassidy and Michael O’Connell all struck fine points as the favourites took over once again. Having taken control the winners failed to stamp their authority on the game and another incredible revival began. Defensive panic produced a Harps penalty after Rogers was fouled. Marley’s effort was deflected onto the crossbar, but Rogers finished to the net. Trailing by 2-8 to 3-8 with 12 minutes remaining, the losers laid siege yet again to the St. Michael’s goal. Their only reward was a Marley point which left them to reflect on what might have been. St. Michael’s will benefit from their great escape. If the standard of play in the decider resembles Sunday night’s fare the supporters of both sides are in for an exciting match and the neutral observer for a feast of football. St. Michael’s – Christy Regan, Gerry McCormack, Jim Reilly, James Murphy; Pat O’Connell, Tom Halpin, Ollie Cassidy 0-1, Michael O’Connell 1-1, Martin O’Connell 0-1, Pat Rafferty, Robbie O’Connell 0-4, Joe Walsh, Gabriel Curtis, Paul Curran 1-1, Jimmy Farrelly 1-0. Subs – Ronan Curran for Curtis, Aidan McDonnell for Walsh. Harps – P. Kavanagh, V. Rennicks, J. Kavanagh, P. English; J. Kenny, M. Yore, C. Murray; D. Rennicks, P. Marley 0-3, K. Rennicks 0-1, S. Martin, S. Rispin 0-2, M. Moriarty 0-2, P. Murray 0-1, D. Rogers 2-0. Subs – C. Burke for J. Kavanagh, D. Murtagh for Martin, M. Buchanan for K. Rennicks. 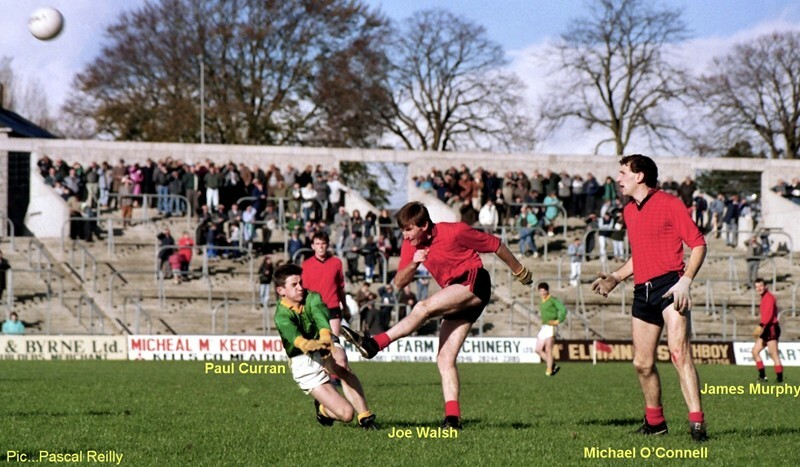 Referee – Joe Moynagh Louth. 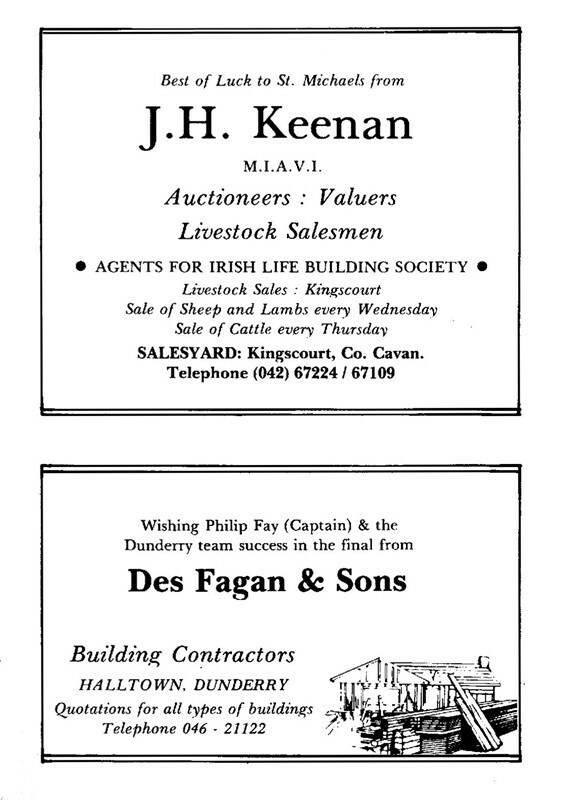 Report from the Meath Chronicle 16th September 1989. 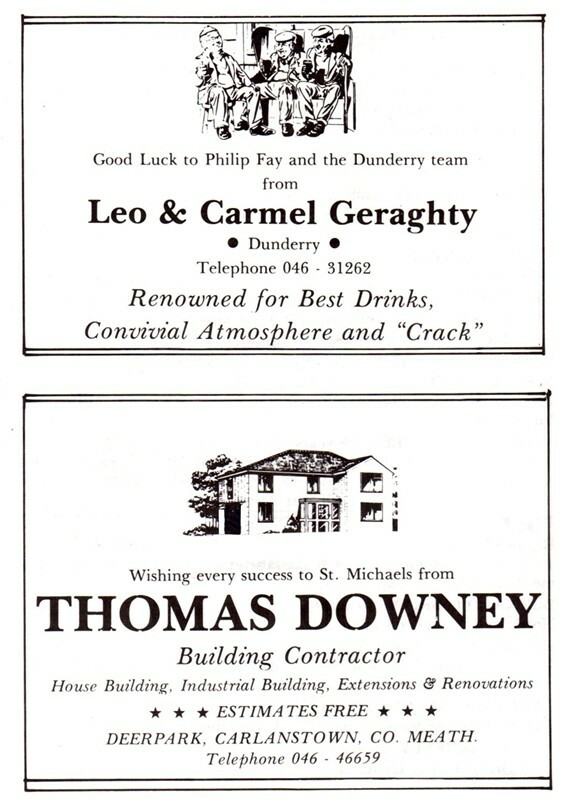 St. Michaels 0-11, Dunderry 0-9. 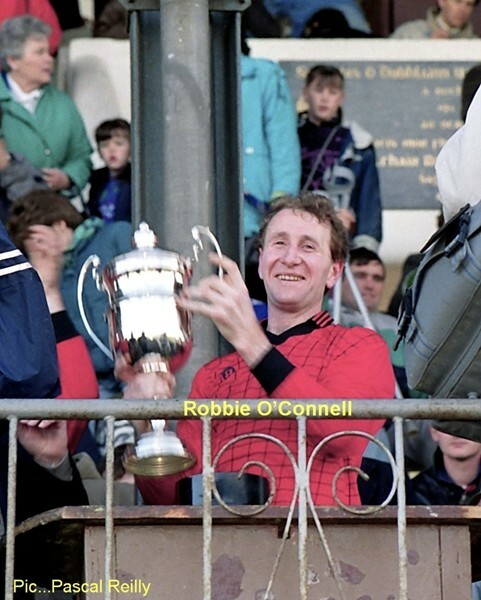 The dividing line between success and failure was highlighted last Sunday when captain Robbie O’Connell, author of the victory, went up to collect the Gaelic Weekly Cup after St. Michaels had devastated Dunderry in the IFC final at Pairc Tailteann, Navan. 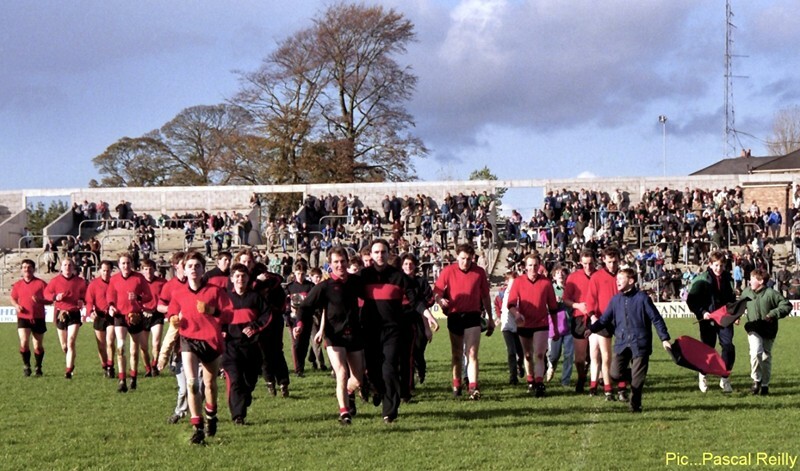 To the foreground were the jubilant St. Michaels supporters drenched in black and red, lauding their players and celebrating the clubs greatest ever victory. But a sad picture existed in the background, grown men cried, players lay prostrate on the ground, heads were dropped – one couldn’t but feel sympathy for Dunderry. Co. Board Chairman Fintan Ginnity had the most difficult task. With any other team it wouldn’t be so bad, but how do you say “your day will come” or “there’s always next year” to Dunderry. Two defeats in successive intermediate finals is hard to handle, but a third defeat is stomach wrenching. If it’s any consolation to Meath’s unluckiest bunch of footballers, they played their part in a fantastic game of football, full of silken skills, physical endeavor, non stop action and deadly accuracy. But there’s two sides to every story and St. Michaels provided the most interesting chapters, a short synopsis best describes the sheer excitement of the game. St. Michaels started well, but Dunderry soon found their rhythm and chalked up five points without reply before the break. With a comfortable three point lead 0-7 to 0-4, third time lucky was a popular catch-line. But you can’t beat unyielding determination and will to win. 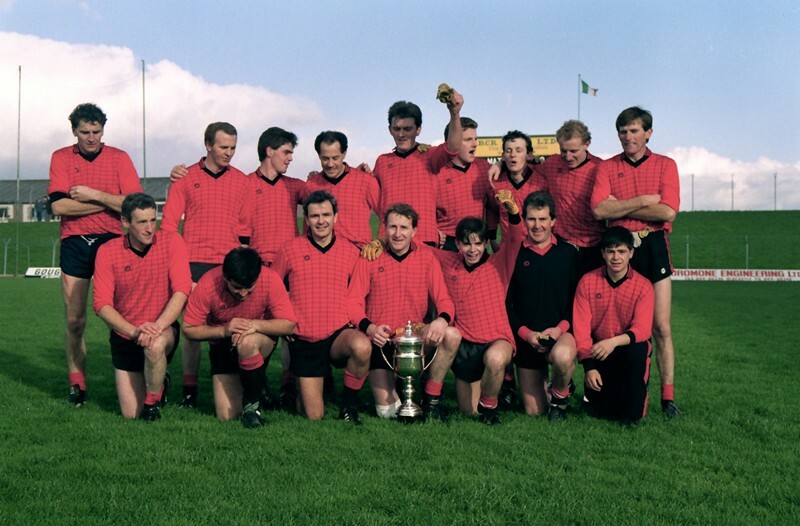 The Carlanstown – Kilbeg men have it in large proportions and it spurred them on to a most memorable victory. If ever a captain led by example Robbie O’Connell did. He capped a majestic display with seven points, but the final two were the most vital, perhaps in his career. But if O’Connell took the scoring honours, then Paul Curran was my “man of the match” . Midfield was always going to be the most crucial battle and for a while it looked as if Phil Fay and Sean Kelly would rule supreme. They did until full-forward Curran switched with Michael O’Connell directly and had the game of his life. With Martin O’Connell also in outstanding form the Mick’s clicked into action and swept past Dunderry in a pulsating second half. 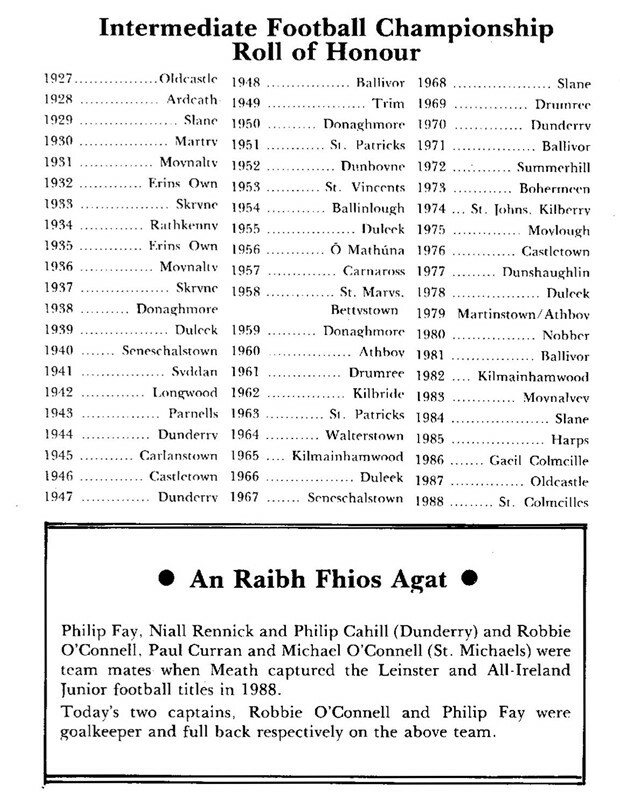 There were other stars too, in defence Jim O’Reilly was virtually unbeatable, while Thomas Halpin was a tower of strength at centre back. Christy Regan, Pat O’Connell, Gerry McCormack and Michael O’Connell also had good moments, while Pat Rafferty and substitute Aidan McDonnell will be remembered for well taken points at vital stages of the second half. The celebrations will continue in Carlanstown for days, maybe even weeks and perhaps months, but for Dunderry it must be devastating . They’ll surely wonder how they threw a good half time lead away, clearly the bottom fell out of them when the saints threw down a big challenge. At one stage it looked as if they accepted their fate. Memories of the past two years came flooding back. Despite being a smaller side Dunderry didn’t lose this through physical disadvantage – they lost it mentally, and yet there could have been a fairytale ending when Kelly went thundering through, but shot miserably wide, it was Dunderry’s final chance. They were however responsible for the best passage of football in the match when they dominated the third quarter. Robbie O’Connell had pointed the way in the opening minutes with a succession of points which helped them into a 0-4 to 0-2 advantage but the black and white clad outfit, inspired by Kelly, Fay and Tommy Dowd fought back and within minutes were coasting. Kelly and Dowd combined with the latter sliding over a fine point to commence the rout. Donie McGourty set John Brady up for the equalizing score before Derek Hickey blasted Dunderry into the lead after a short Fay “45”. Brady shot the third of his five points and by now it was time for the winners to act fast as they were losing out badly at midfield where the roving Niall Rennicks was also causing problems. Curran was the ace in the pack, but it didn’t stop McGourty from scoring a fine point from a difficult angle which set Dunderry up nicely at the break. The Micks almost had a tonic start to the second half when a Robbie O’Connell free was fisted to the net by Jimmy Farrelly but referee Kevin Campbell, who baffled many by the number of questionable decisions disallowed it for a square infringement. But Martin O’Connell soon set the matter straight when he lofted over a 45 metre free after Joe Walsh was fouled. Robbie O’Connell reduced the gap to a point which really set the game into overdrive. John Brady installed his side as favourites entering the final quarter when he punished a foul on Rennicks, but Aidan McDonnell kept the north Meath men in touch with a point from the right wing. Curran and O’Connell were ruling the roost at this stage and a perfect delivery from Martin to Pat Rafferty set the half forward up for the equalizing score. Robbie O’Connell converted another free which gave them the lead for the first time since the 17th minute. 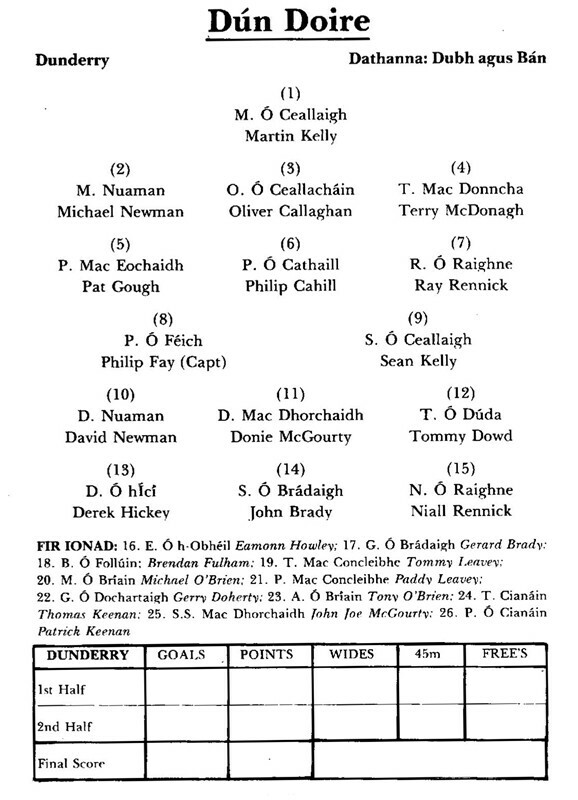 The Dunderry resistance was breaking slowly under the pressure of facing up to a third consecutive defeat, but Brady kept them hanging on by a thread with a pointed free. In a rousing last few minutes Robbie O’Connell sent over two great points from frees to send the cup to Carlanstown. Christy Regan, Gerry McCormack, Jim O’Reilly, James Murphy, Pat O’Connell, Tom Halpin, Ollie Cassidy, Michael O’Connell, Martin O’Connell 0-2, Pat Rafferty 0-1, Robbie O’Connell 0-7, Bernard O’Brien, Joe Walsh, Paul Curran, Jimmy Farrelly. Aidan McDonnell 0-1 for O’Brien, Justin Stafford for Farrelly. M. Kelly, M. Newman, O. Callaghan, T. McDonagh, P. Gough, P. Cahill, R. Rennicks, P. Fay 0-1, S. Kelly, D. Newman, D. McGourty 0-1, T. Dowd 0-1, D. Hickey 0-1, J. Brady 0-5, N. Rennicks. Subs: B. Fulham for Hickey, E. Howley for R. Rennicks. Report by Colm Keys for Meath Chronicle. Dunderry completed the unenviable ‘feat’ of losing three IFC finals in succession on Sunday in Pairc Tailteann as St. Michaels valiantly and deservedly took the title in a match that was always tight and fiercely contested. Not until Kevin Campbell’s final whistle sounded could the Carlanstown-Kilbeg men finally relax in the knowledge that victory was theirs. Indeed, as the game moved into injury time Dunderry’s Sean Kelly missed a golden opportunity of netting. 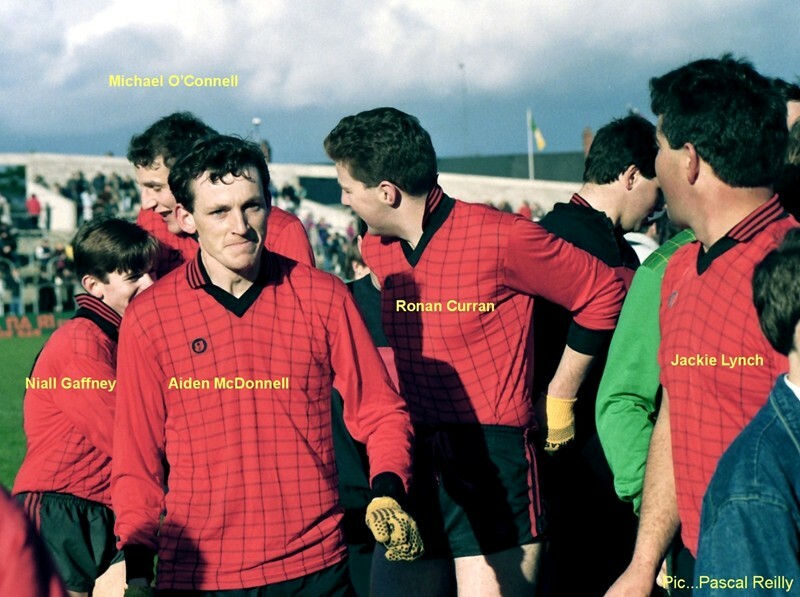 The vital points that secured the title for the Michaels came from the right foot of Robbie O’Connell who’s captain’s role saw him kick 7 points over the hour. His winning strikes resulted from fouls on Pat Rafferty and himself. In each case O’Connell sent his shot sailing smoothly between the posts. The match, which saw St. Michaels settle best initially before Dunderry stormed back to take control of the second quarter, produced honest football but an hour of fare that was far from memorable. That won’t worry the winners and their fervent supporters but Dunderry will rue the manner in which they lost. The Michaels edged in front in the 19th minute through Robbie O’Connell’s second pointed free to which he added another from play four minutes later. This 0-4 to 0-2 lead looked set to give the red and blacks a vital advantage moving up to the interval. Instead, Dunderry began to find their teamwork and five points in six minutes suddenly turned the game their way. Tommy Dowd finished off a lovely four man move for the first to which two by John Brady and one each by Derek Hickey and Donie McGourty left St. Michaels in trouble. The half time break intervened and St. Michaels made the most of it. Martin O’Connell reduced the difference to two points, 0-7 to 0-5, after a Jimmy Farrelly fisted ‘goal’ had been disallowed for a ‘square ball’ infringement. Robbie O’Connell added another score for St. Michaels before Brady’s free made it 0-8 to 0-6 in favour of Dunderry. By this stage, however, the strength of Robbie O’Connell and the partnership of Martin O’Connell and Paul Curran at midfield began to bear fruit. The 45th minute saw Aidan McDonnell reduce the arrears to the minimum and two minutes later Pat Rafferty levelled the scores, 0-8 each. Dunderry’s grip was now slipping rapidly from their grasp and Robbie O’Connell put St. Michaels in front. With five minutes remaining John Brady equalised with a free to set up a pulsating finish to the match. It was then that the effectiveness of the two attacks proved decisive. Dunderry’s seven wides in the second half stood in marked contrast to their opponents zero count. As had happened on their road to the final St. Michaels made hay while the sun shone and took their scores. O’Connell’s two late frees underlined this fact and served as a lesson to all teams who aspire to winning championships. 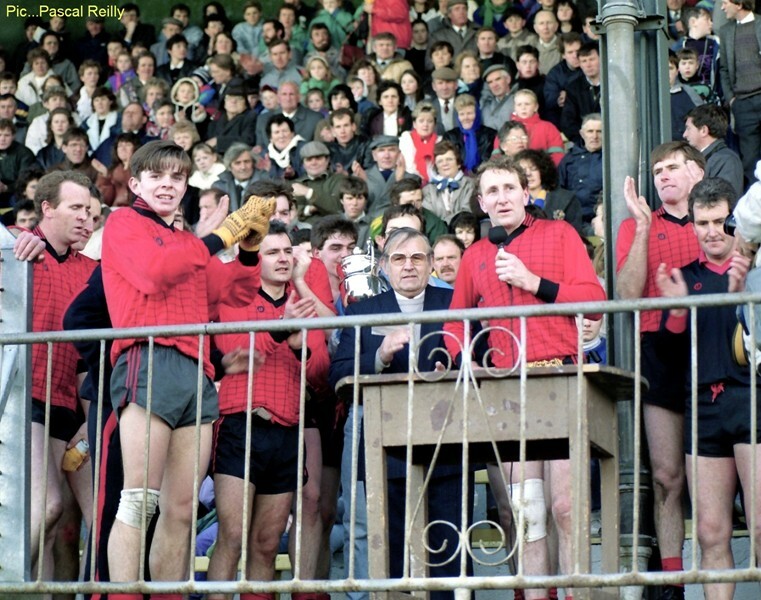 Dunderry heads hung understandably low after the match as O’Connell mounted the steps in the stand to receive the Gaelic Weekly Cup from chairman Fintan Ginnity. 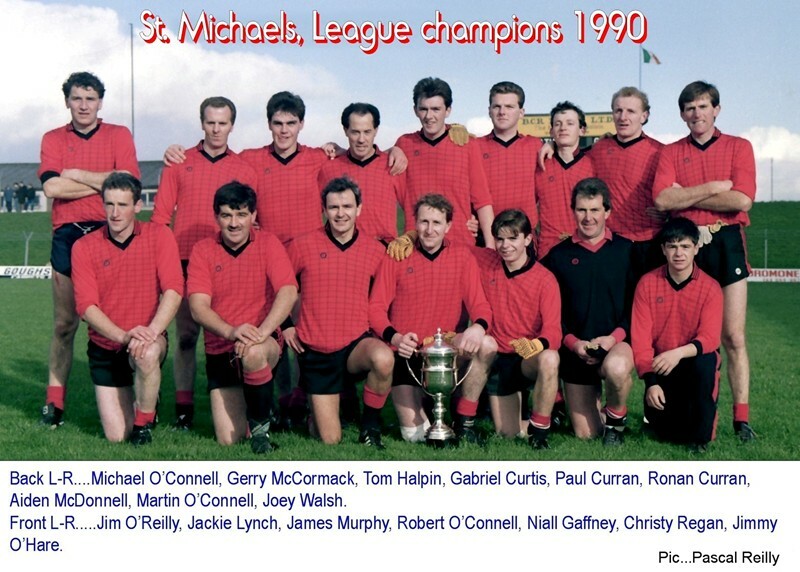 For St. Michaels the victory completed a glorious decade for football in the Kilbeg parish and on Sunday’s display, they deserved it. 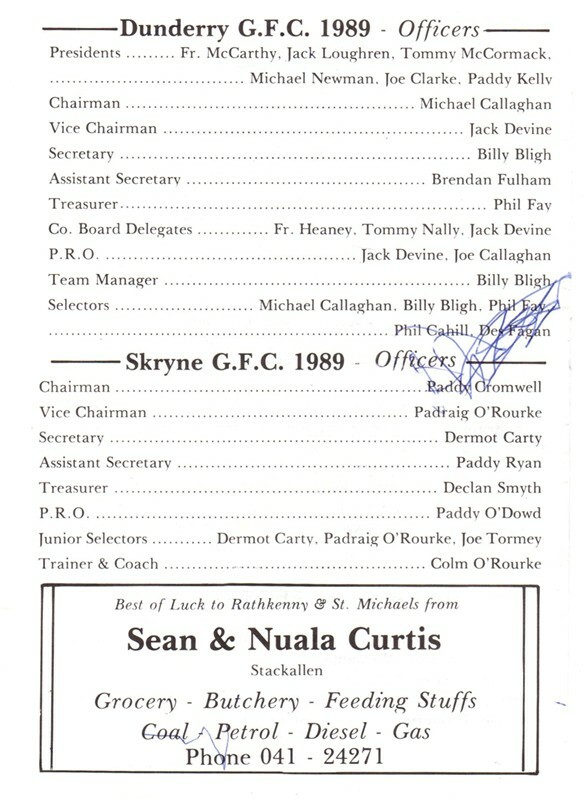 SFC First round, played in Dunderry. St. Michaels 0-5, Moynalvey 1-13. St. Michaels got off to an inauspicious start in the senior ranks when being well beaten by Moynalvey in Dunderry in Sunday nights SFC clash. Gabriel Curtis had two great goaling opportunities for the losers, one in either half, but all he managed for his efforts was a single point. Adrian O’Halloran scored six of Moynalvey’s points and along with John Ennis and Cathal Sheridan he formed a lively half forward line, Sheridan had to retire in the second half feeling the effects of an early knock. It was 0-8 to 0-1 at the break with Robert O’Connell getting Michaels only first half score. Liam Harnan who lined out in the usual position of full forward exchanged passes with Ennis and blasted the ball past Christy Regan from close range after 50 minutes to end the game as a contest. At that point the Saints were forced to play out the last ten minutes with 14 men when Paul Curran had to go off with a muscle injury after they had used their full quota of substitutions. By that stage it was a matter of playing out time and before the finish Moynalvey tacked on points from P.J. Walsh and Declan Smith to run out comfortable winners. Christy Regan, Jackie Lynch, Jim Reilly, James Murphy, Pat O’Connell, Tom Halpin, J.J. Moran, Martin O’Connell, Paul Curran 0-1, Aidan McDonnell, Robert O’Connell 0-3, Bernard O’Brien, Gabriel Curtis 0-1, Michael O’Connell, Joe Walsh. Ronan Curran for Curtis, Justin Stafford for Moran, Gabriel Curtis for McDonnell. B. Melia, P. Regan, P. Harnan, J. Byrne, J. Cunningham, P. Kelly, M. Regan, J. Corcoran, A. Crickley 0-4, J. Ennis, A. O’Halloran 0-6, C. Sheridan 0-1, P.J. Walsh 0-1, L. Harnan 1-0, D. Smith 0-1. Report from The Weekender dated Saturday May 19th 1990. St. Michaels 0-14 Castletown 1-6. 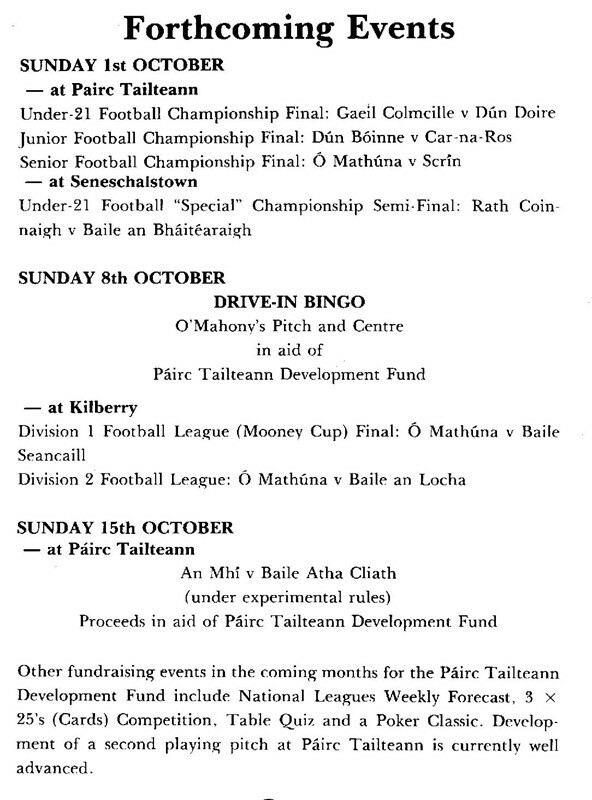 Sunday October 28th 1990 in Pairc Tailteann. The scoring power of the O’Connell’s steered St. Michaels to this Meath F.L. Division 2 title. Martin, Michael and Robbie provided the winners with 12 of the 14 points as they made amends for an otherwise unsuccessful season. The real inspiration came from Martin who gave a great performance for the second Sunday running, to which Castletown had no answer. The margin of victory would have been greater but for a freak Castletown goal from full-back George Clarke, who came 70 metres up-field to take a 40 metre free which he sent straight to the back of a badly guarded net after 35 minutes. St. Michaels used the wind advantage to build up a 0-7 to 0-2 half time lead but Castletown added the next two points from Jimmy Young and Christy Reilly. Clarke’s goal drew the sides level at 1-4 to 0-7 and then Martin O’Connell with only goalkeeper Gerry Clarke to beat, shot wide along the ground. Robbie O’Connell pointed a free after he himself was fouled, but Clarke again rushed 60 metres up-field to convert an equaliser from 47 metres. This was virtually Castletown’s last hurrah because Martin O’Connell intervened and wrenched his side from defeat, being fouled for Robbie’s next pointed free and scoring one himself. Gradually St. Michaels pulled away with Jim O’Reilly, Tom Halpin and Aiden McDonnell, Paul Curran and Niall Gaffney in top form. Castletown’s last score came from Jimmy Young. Michael O’Connell who had an impressive first half scoring three points from play, but it was their best known player Martin who had the biggest influence with his driving runs from midfield and perfectly placed passes which cut the Castletown defence wide open. In the last few minutes he dropped back behind the defence to make some telling clearances. Robbie, who was faultless from frees, converted two more late in the game , but substitute Justin Stafford paid a heavy price for scoring the closing point when he shipped a heavy knock which necessitated hospital treatment. Co. Board Chairman Fintan Ginnity presented the Gaughran Cup to St. Michaels captain Robbie O’Connell. Justin Stafford 0-1 for Jimmy O’Hare. 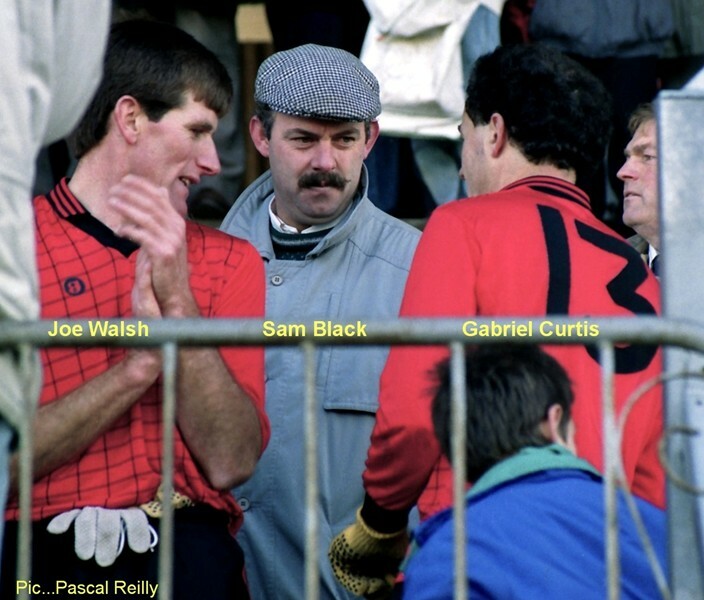 Ollie Shanley, Paddy O’Connell, Sean Gaffney, Paddy McIntyre & Ambrose Cassidy. All photo’s were taken by and are the copyright of Pascal Reilly. St. Michaels / Wolfe Tones 1-7, Dee Rangers 0-8. 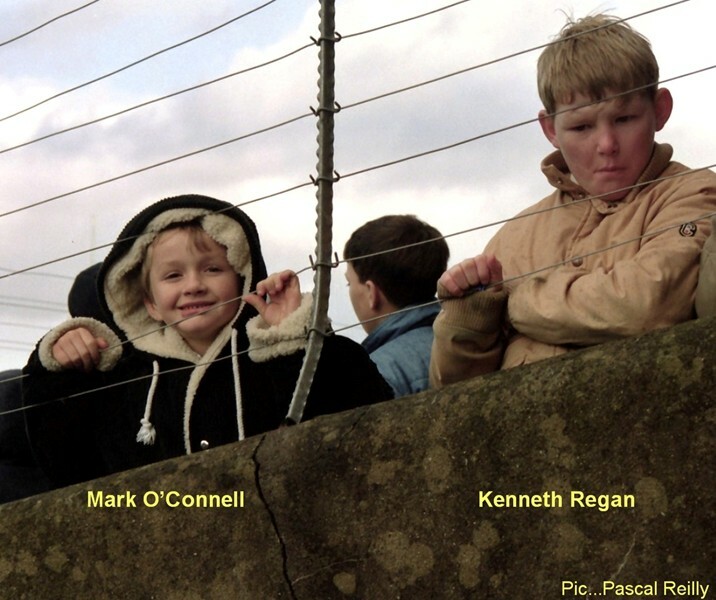 Friday July 13th 1990 at Kells. A St. Michaels / Wolfe Tones combination held on to beat Dee Rangers and capture the MFL title at Kells. In an exciting second half the combined forces reduced the interval deficit, took the lead and then defended it in the closing stages. Dominic Moran got the all important goal, while Malachy Thompson’s four pointed frees were crucial. Thompson was particularly impressive for the winners with James Mulvaney, Alan Glennon, Kevin Lynch, Niall Gaffney and Jimmy O’Hare assisting well. Gerry Clarke, Sean Gaffney (st.m), Patsy Curran (st.m), Tommy McKeever & John Thompson.